She’d just summarized my own experience with favorite conflict resolution books and a protest I’d heard before: the sense that the best conflict resolution books help us understand our conflicts in fresh ways, yet can overwhelm us in the process. We love what we’re reading, yet can’t retain enough of it for use later. He was right. In the heat of the moment, most of us don’t have the wherewithal to sort through a series of mental recipe cards, looking for and then selecting the approach that will help us then and there. Kregg and Jen, two very smart graduate students, couldn’t do it. I can’t do it consistently either—and I am a professional conflict resolver. Jen’s and Kregg’s comments left me pondering, What three things can make the most difference in the way a conflict unfolds? Business partners Chris and Avery asked me to help them sort out a difference of opinion about how to run the small eight-person company they had cofounded. Things had gotten bad enough that neither partner was talking to the other, communicating only via their shared executive assistant (poor woman). When the mediation was over and they’d come to agreement over the issues that had divided them for many months, we sat together over coffee and mused about the trajectory their conflict had taken over the past year. Chris said, “With the benefit of hindsight, I see now that either of us could have prevented the problem from escalating. I could have stopped the momentum by doing one or two things differently anywhere along the way. But I felt powerless to change what was happening without Avery also joining the effort.” Avery nodded, agreeing with the sentiment. We find ourselves in conflict with others who share our work and our lives—people with whom we want or need to be in continuing relationships—and we figure that since it took two (or more) of us to create the conflict, it’s going to take two (or more) of us to resolve it. But is that necessarily true? It’s not. Chris’s comment left me musing, How can we dramatically shift a conflict without relying on what the other person will or won’t do? Her comment was spot on. When in conflict with those we’re closest to, it’s tempting to focus on the presenting problem of the moment: Should the person who empties the coffeepot be responsible for making fresh coffee? Was that project deadline reasonable? Whose turn is it to fold the laundry? Answering those questions may yield momentary relief, yes. But if we’re in an ongoing state of tension with someone, those answers will be Band-Aids at best. Another presenting problem will be waiting for us tomorrow, wearing us down while at the same time building up the wall between us. Nicole’s clarity left me to figure out, What can help us move beyond a state of chronic conflict in our most important relationships at work and home? These three questions resonated deeply. I’ve been in the conflict resolution field for a while now, and I’d like to think I know a useful thing or two. 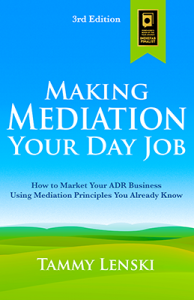 I’ve mediated thousands of disputes in person and online, coached hundreds in successfully navigating conflict, taught negotiation and conflict resolution in several graduate programs, and trained hundreds of new and seasoned mediators in mastering our craft. In all of this work, I could see clients and students challenged over and over again in the same ways that Jen, Kregg, Chris, Avery, and Nicole were. And I could not help but notice that some of my own conflicts would benefit immensely from answers to the same three questions. When I tried to take what I know as a professional conflict resolver and use it in my own life, the results were mixed. Sometimes I handled things quite well. Sometimes I prayed no one who knows what I do for a living was watching at that moment because if they were, I’d be obligated to have “fraud” tattooed on my forehead. When I tried to remember long conflict resolution recipes during high-heat moments, too often the result was my own muddled mind. Approaches that work well with concrete disputes, like those involving a policy change or the amount of money to spend on new kitchen cabinets, worked dismally in states of tension and conflict. And I intensely disliked the helplessness I felt when I couldn’t persuade someone else to join me in collaborating on a cessation of hostilities, and so the conflict remained, hovering in the air between us. Jen, Kregg, Chris, Avery, and Nicole launched me on a quest to identify a simple, straightforward approach that addressed the questions born from their comments. I wanted an approach that is memorable, with a visual metaphor–an idea that ultimately led to “pivots”–to help anchor the concept in your mind for easier retrieval when you need it most. I wanted an approach that would help people avoid the most common conflict pitfalls I witness repeatedly while working with clients. I wanted the approach to be easily learnable and one that would be useful with any kind of conflict in an ongoing personal, professional, or business relationship, the very conflicts that fray us at the edges if we don’t address them. And I wanted an approach that could head off the escalation of some of life’s simpler conflicts and help you get your feet back under you before you’re off to the races. It was a tall order. For the last decade I have been experimenting on myself (and my exceedingly patient husband), putting ideas to the test with clients, getting feedback from my graduate students, then refining and reworking, distilling and paring. The quest has brought us to this book and to the three conflict pivots described in the coming pages. The Conflict Pivot is organized to give you immediate access to the approach so that you can begin experimenting with it today, if you wish. Part 1 of the book introduces the pivot practices. Chapter 1 describes the guiding principles on which the three conflict pivots are based and why they matter. And lest you mistakenly believe the pivots can fix all conflict that ails you, I discuss the value that conflict has in our lives and ways to use the pivots not just to get past conflict, but to develop a healthier relationship with it. In chapter 2, I briefly introduce the three pivots and provide a worksheet you can use to walk yourself through the three practices. Part 2 focuses on each of the pivots in detail and is intended to build your fluency with them. Chapters 3, 4, and 5 take a deeper dive into each pivot, offering you depth of understanding for better mastery. I share examples from my own life and from situations clients have faced. Seeing how others have handled conflict pivots can offer insight into your own. Part 3 wraps up the book. In chapter 6, I address the questions clients and workshop participants have asked most frequently about the pivots, hoping that in so doing I’m answering remaining questions on your mind as well. In chapter 7, I discuss ways to begin applying the pivots in your life and work. I suggest ways to practice pivoting so that it becomes a habit, a reflex action during conflict that can, over time, overtake the less beneficial habits you may have now. Together, these latter chapters are there to help you assimilate the pivots into daily life. The conflict pivots best shine a light into the darkness when you make them your own. Copyright © 2014 Tammy Lenski. All rights reserved.